The old saying, “An ounce of prevention is worth a pound of cure,” rings especially true if you have a septic system. Consider this: It only costs about $300 every four years to maintain your septic system. But it can cost $7,000 to $10,000 or more to repair or replace it. Plus, a poorly maintained septic system can contaminate groundwater/drinking water and spread disease. You can’t put a price on the health and safety of your family. The water line coming into your home does not have a meter. 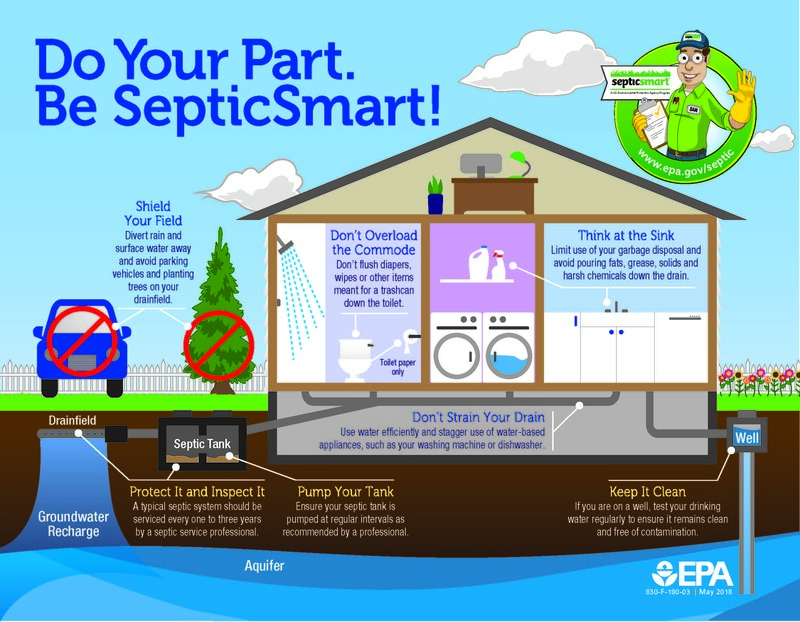 Septic Smart Week is Sept. 17-21 and a good time to not only have your system maintained but review ways to keep your system working well. Inspect and pump regularly: In general, your septic system should be inspected every one to three years and pumped every three to five years by a certified septic system professional. Plant trees an appropriate distance from your drainfield. A septic service professional can help you with the property distance. Keep roof drains, sump pumps and other rainwater drainage systems away from your drainfield areas. Excess water can slow or stop the wastewater treatment process.